This commercial fire fighting version of the BrushMaster machine is used to create fire protection in the area of Wildland Urban Interface. 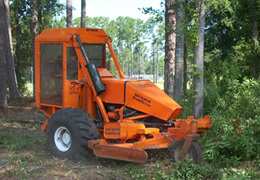 The machine reduces all brush to clippings that lay flat on the ground. Small trees under 4" in diameter are cut down after which their branches are removed and chipped. Wind permitting, the flames of any forest fire that burns up to these mitigated areas will drop to the ground, burn with a low slow moving flame, smolder, or go out. Fire fighters can extinguish anything that remains with a tamp. Trees larger than 4" are left standing because the higher canopy typically will not catch fire once the brush beneath it has been eliminated. The mechanical removal of 100' to 400' of understory is the most attractive and cost effective method for dealing with fire containment in the areas of Wildland Urban Interface. 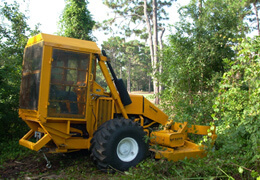 The land clearing machine will reduce the undergrowth in typical southern forest land at a cutting rate of 1 – 1 ½ miles/hour at a 7 foot width. This equates to 1 – 1 ½ acres per hour. A single machine cutting 8 hours a day for 3 days will produce a fuel break of 1 – 1 ½ miles long by 200 feet wide. The FireMaster® slope mower operates on steep slopes up to 32 degrees with zero turn radius maneuverability. The cut material mats the forest floor making it passable for vehicles to travel over cut areas, which is an advantage over plowed areas. The root structure is not damaged preventing erosion and mud slides. New growth returns which is not readily flammable for about one year. Animals and birds can get to the ground to feed. They are attracted to and thrive in areas cut by the Firemaster. Environmental friendly - Trees, animals, and birds thrive. Roots are not damaged so that they can continue to stop erosion. Cabin Configuration: All FireMaster machines are factory equipped with a recirculating closed system air conditioner to protect the operator from smoke and other contaminents. The cabin enclosure has metal framed doors. The door windows, as well as the rear opening, are all covered with Lexan sheeting. The key windows are covered by metal guarding. GPS for navigating to areas to be cleared, to fires and/or lightning strkes, and to roadways for escape routes. 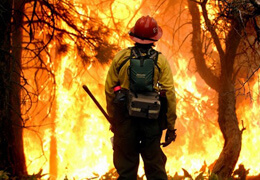 If you don't have a FireMaster, you're not clearing land as quickly and efficiently as you could be! The FireMaster® commercial slope mower was designed by an engineer-educated, real estate developer since the other equipment on the market simply could not perform the task. The FireMaster® was specifically developed to clear property quickly – up to 5 times faster than the competition – leaving an attractive appearance to the land while retaining larger trees. The FireMaster® also works on slopes up to 32° and comes standard with a powerful 72 HP Yanmar, liquid cooled diesel engine and dual hydrostatic transmissions that allow the zero turn capability that is so necessary for efficient clearing. The 88” front mount, triple blade, rotary deck clears everything in its path, making this machine perfect for right of ways, parks, trails, survey lines, wildland-urban interface areas and the removal of brush for fire protection. The FireMaster® is so reliable that it is supported by a one year warranty. For highest efficiency, lowest labor, minimum maintenance and longest life – get the FIREMASTER®!